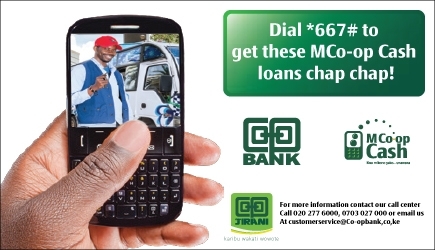 Mobile loans have become so popular in Kenya with several organizations offering various products with flexible payment periods and applicable interest/charges. One of my favorite loan facility has been Co-operative bank’s MCo-op Cash, at least until recently when users were now required to have their employer details recorded as well. According to a cheerful customer care representative I spoke to, this is essentially done to curtail those who default. But the big question I kept asking myself is if this will help Coop Bank by only allowing healthy loans or harm it as many customers will consider other providers instead of going through the hassle of adding their employer details. Previously, as long as I didn’t have an outstanding loan, I could borrow as much as my month’s full salary and half, i.e. if I earn Ksh. 20,000 per month, I was eligible to borrow Ksh. 30,000 payable up to 3 Months. However, since their systems changed, I’ve been getting this message, “Dear customer, your loan application is unsuccessful because your employer details are not updated. Kindly call 0703027000 for assistance” whenever I apply for a Flexi Cash Salary Advance loan. As their slogan clearly says “Get a short term loan to see you through your next pay day!”, this was one product that really helped me when short of cash to push through pay day. In fact, I could borrow quite a lot compared to the likes of M-shwari and KCB-MPESA which requires users to build a reputation first while increasing loan limits at the same time. Borrow from Ksh 3,000 to a maximum of Ksh 100,000. Comment: I have tried to apply for a 3 month flex loan but am not getting it. Hi,am kelvin kemboi working at sarit centre as a BM security officer earnings Ksh 15000 per month but have tried to request Ksh 20,000 a 3 month flexi loan but my maximum limit is Ksh 7991. why so and I thought its one and half amount you earn a loan should be?